Why not take in season fruit to create a sweet smelling centerpiece. Display your favorite delectable delights in a clear vase for bright bursts of color. Scatter them down a dining table runner for unexpected desserts to munch on after a festive party. To create a simple yet elegant display, you only need a few items. First, decide which fruit you want to use as your centerpiece and how you'll display these sweet delights. I really like a simple white vase or urn as the base. Clear vases or any clear bowl work well and can also create stunning displays. 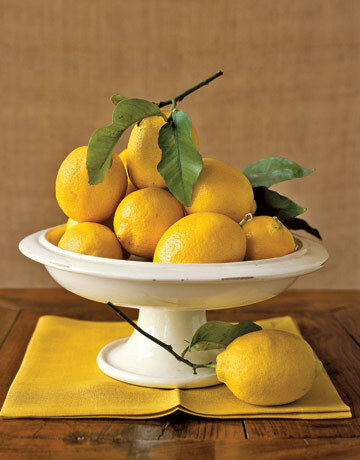 One of my favorite fruits is the meyer lemon. These wonderful fruits bring back strong memories of living in California as a kid and baking lemon meringue pies almost every weekend. They are also wonderful because you can eat them alone like you would an orange or tangerine. Their smell is very distinctive and will permeate your room. To create this utterly simple display, find oranges with their stems and foliage attached, if that's possible. Begin arranging them inside the bowl so they form a triangle design, or close to it. The top of the centerpiece should be one lone lemon. Don't worry about placing them perfectly, in fact they look more natural when you plop them around randomly. Under the vase add a table runner or piece of material to accent the arrangement. 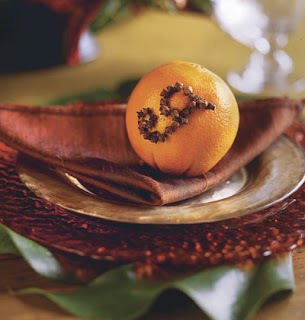 Another simple and delicious way to use a fruit at your next dinner party is with oranges and cloves. Yes, I said oranges and cloves. That's all you need. Begin by poking the cloves into the orange, navels work best because of their larger surface area, and use the cloves to design their first or last initial on the orange. This piece of fruit now becomes their place holder at your next dinner party. The scent of the cloves mixed with the citrus smell will fill the air and can also be used as a partying gift for friends and family. How simple is that? For those of you who live in cities without the luxury of having your own home office, I feel your pain. Small, cramped apartments or tiny one bedroom lofts are hard to arrange to include your own cozy workspace. Here are some ideas on how to convert any space in your home into your own home office. A small closet, originally used to store your coats and other accessories, can be turned into your own home office. First clear out all of the items in the space, including the closet rod. To keep the costs down, find a small desk, one already in your home, or at your local consignment store that can be inserted into the closet. Check out any local universities that have a surplus department where you can find very cheap desks. Make sure you can still close the closet doors so be sure to measure the space beforehand. Another idea, and one that costs a little more, is to invest in custom shelving across the closet. This will allow a functional work surface and shelving for books and other accessories. If you're handy, you can also create your own shelving by visiting your home improvement store and having them cut shelves to fit inside the closet. Now to the fun part. Buy colorful storage boxes to store your pictures and other trinkets and to keep clutter at bay. You want a clean workspace that invokes a minimal feel so keep the junk stored above on your shelves. Ikea and the Container Store both carry storage boxes in every color imaginable. Lighting is also key to your cozy space. Don't use harsh overhead lighting, rather find a simple desk lamp to place in the corner of your space. I love the Barometer work lamp from Ikea becuase it takes up little space and has an adjustable arm. It also comes in a few different colors which is perfect for matching to your design palette. Now for the seating. Stay away from the oversized and boring black office chair. Go for something simple that can also be used in your living space for extra seating. The Patrik chair from Ikea is a vibrant chair that would look cool anywhere in your home and it comes in 2 colors. To keep your budget down, use one of your dining room chairs that can be stored when you're not using the home office. Have fun!